Is A Root Canal The Right Thing For You To Do? Please read this page carefully and we encourage you to ask your own questions. We are always available to discuss this issue as we feel a real responsibility to inform people properly. We want people to have all of the information so that they can confidently make up their own minds. Is a Root Canal the Right Thing To Do For You? At Holistic Dental Center we neither oppose nor promote root canals. The fact of the matter, from our viewpoint, is that in the case of dental problems that affect the roots of the teeth, it is probably improper and irresponsible to say that there is any single treatment that can be definitively prescribed for every case. Root Canals, as well as alternative solutions, carry risks and benefits and each patient’s particular situation should be assessed on an individual basis. …replace it with a bridge. …replace it with an implant. At Holistic Dental Center, we provide all of these solutions to our patients and focus on providing all the information to them so that the optimal solution can be made for each individual case. Our office is mercury-free and holistic. We are a caring practice with an emphasis on creating a healing atmosphere and we can meet those ideals while practicing any of the above solutions. Is it better to have a root canal or have the tooth pulled? What are the consequences of a root canal? What are the consequences of getting the tooth pulled? I have a root canal and I recently read that it is dangerous to keep the affected tooth. What are the risks? What do I know if I am at risk? To begin to answer these questions, let’s first look at some of the information commonly found on the subject. There is a school of thought in the holistic dentistry community that root canals are dangerous, should never be done, and if you have had one, that it should be removed. Sometimes there are acceptable alternatives to a root canal, but not always. Support for this is most frequently substantiated by a book called “Root Canal Cover-up Exposed!” by Dr. George Meinig, in which he reviews the research of Dr. Weston Price on the issues surrounding root canals. Dr. Price did a great deal of fascinating research into root canals, infections and treatment in the early 1900s and came up with some rather astounding findings. Dr. Price’s basic premise was built around the idea of focal infections. Focal infection was a prominent idea in medical practice at the time. A “focal infection”:http://en.wikipedia.org/wiki/Focal_infection_theory is an obscure infection, poorly recognized, that disseminates microorganisms or toxins elsewhere within an individual’s own body and thereby instigates injury and disease, usually chronic, at distant sites. This can include things like atherosclerosis, arthritis, cancer, and heart disease. Dr. Price’s theory was that infection in the gums could spread to the heart or other area where it could be dangerous or even life-threatening. The idea has never been disproved and, despite a great deal of very compelling evidence to support it, it has never really become broadly accepted. In order to fully understand this theory, it is important to understand the anatomy of a tooth. 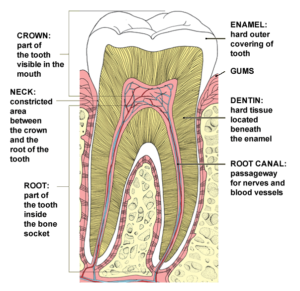 In the center of each tooth is a nerve, the root. In the center of the nerve is a hollow space, the nerve canal or root canal. This hollow space isn’t necessarily a straight column, it may have curves or small branches, but this space makes up the root canal (not to be confused with the procedure, which involves removing the nerve). In healthy teeth, the space is filled with capillaries that supply blood to the nerve. There is an area that makes up the bulk of the tooth called the Dentin that is filled with millions of tiny tunnels branching off the central space of the tooth. When a root canal procedure is performed, the nerve is removed and the entire space is cleaned out and antibiotics used to sterilize any remaining bacteria. Finally, the space is filled in to support the tooth structure and prevent bacteria from invading the now vacant space. According to Dr. Price and Dr. Meinig, the tiny tunnels of the Dentin provide plenty of space for bacteria to hide from the dentist’s efforts to eradicate them. This theory has recently been confirmed using an electron beam microscope. Dr. Price experimented with implanting infected teeth, in some cases pulverized infected teeth, of people with a variety of health issues under the skin of lab animals. In a short time, the animal would come down with the very same conditions as the person from whom the infected tooth came. Now, it might be reasonable to expect that the infection from the implanted teeth might spread to other parts of the body, but the surprising outcome was that the infection manifested in the animal in the same way that it had in the person. For example, if an infected tooth from a person with heart disease was introduced under the skin of a lab animal, the animal developed heart disease. Current medical theories cannot adequately explain how frequently and how closely the ailments developed by the lab animals reflected those that had been seen in the patient. Beyond this, Dr. Price reported finding that 95% of all focal infections begin in the mouth, particularly in the teeth and tonsils. His theory was that harmless bacteria found in the mouth gets trapped in teeth and tonsils, causing infection. When a root canal is performed, it changes the environment of the tooth and cuts it off, seals it, from its normal exchange with the body. There are common bacteria found in the tooth; good, symbiotic bacteria; that exist in the tooth that now are forced to live in an environment that is lacking the things that they would normally thrive upon, including oxygen. This causes the bacteria to mutate into a new type of bacteria in order to survive in this new environment. These new bacteria are dangerous bacteria. These bacteria exist and mutate within the tiny tubules of the dentin. The problem is based in this fact: It had been mechanically impossible to completely sterilize a root canal tooth because the tubules of the dentin were too small to reach with sterilizing agents of the time. So, now you have dangerous bacteria in your teeth that are cut off from any ability for us to reach and kill them so they remain safe from any treatment for removing them. There is no way to get any antibiotic to them in order to kill them. These bacteria then thrive and begin to release toxins every time you chew. The mutated bacteria can also then get into the bloodstream and travel through the body, leaving toxins in their wake and settling in distant parts of the body, causing damage and disease. This is the exact point where someone might suggest that one’s immune system could attack and handle the problem. It will, in fact, be able to handle quite easily these dangerous bacteria. However, at any time your immune system becomes compromised or weakened such as by injury or illness, the immune system may no longer be able to control these pathogenic bacteria and the bacteria can then spread and migrate. This is the exact reason why the problem with root canals does not appear, at first, to be a problem. Because one’s immune system can frequently handle the situation but after some time, when situations are right, problems can arise and they are never considered to be connected to the root canal because so much time has past since the root canal and the time that the diseases arise in other parts of the body. It is our opinion that Dr. Price made some persuasive points. So How Do You Properly Use This Information? First, it seems that if a root canal is to be done, it is best done early. As well as simplifying the process for you, performing the treatment earlier helps to reduce the chances of infection developing inside the tooth and hiding in the tubules where it is difficult to treat. Early root canal problems are caused by inflamed nerves. If untreated, inflamed nerves become infected nerves, and it becomes much more difficult to effectively treat. Secondly, it seems very obvious that the current state of the patients overall health is quite important. If patients have any allergies or their immune system is compromised with any auto-immune disease, the risks for performing a root canal are likely too great. Another valuable consideration and tool for unraveling the question of whether or not to save the tooth or pull it is The Meridian Tooth Chart. Each tooth in the mouth is related to various organs, tissues and glands in the body on a particular meridian or “energy highway.” If a person has a weak internal organ, the condition of the associated meridian tooth could make it considerably more problematic. If a patient is having any trouble with the organs that are connected to the “sick” tooth as indicated by the Meridian Tooth Chart, I find it highly unadvisable to save the tooth. The results we have had with this are fantastic. The third issue is that there is only one medication that is commonly considered to be able to really eradicate even the most drug resistant bacteria in the tooth, calcium hydroxide. Calcium hydroxide has been proven to be more powerful than modern pharmaceuticals, but most dentists who do root canals only use calcium hydroxide in very specific cases. It should be used much more frequently for root canals, and for a longer course of treatment. I normally use it for 2 to 3 weeks with my patients. With all these issues, why would any dentist ever advise having a root canal procedure? It comes down to the alternatives. If you have an issue serious enough to warrant root canal, the most likely alternative is extraction. If you have a tooth, or multiple teeth, extracted, will you have them replaced, and if so, how? You could just decide to leave an open space. This is a valid option, but if it’s a front tooth, you may not want to have a visible gap in your teeth. With back teeth, there may not be the aesthetic issues, but missing back teeth can still cause a slew of problems. Not only can you develop problems with your gums and reduced chewing ability, but also problems with bite leading to TMJ, cranio-sacral problems and even chiropractic problems. It is possible to remove teeth and not have any issues at all, but most people will have some kind of trouble at some point so I don’t ever recommend this option. The majority of people who have teeth extracted will opt to have them replaced sooner or later for any number of reasons. The first option for replacing teeth is with removable partial dentures, bridges that you can take out to clean. Many people see bridges as unattractive and dirty. They do the trick, but not well. As replacement teeth, they are functional, but inadequate to some degree. Many people prefer a more permanent replacement that feels more like real teeth. To obtain a more natural replacement requires a fixed bridge with caps or an implant consisting of zirconium posts integrated into the bone to imitate lost roots. Generally, Zirconium Implants are a great option. However, they cost more and involve surgery and all of the risk associated with any surgery. The reward is wonderful though. They look fantastic and they last for years and, holistically speaking, zirconium is a metal-free substance – far healthier than traditional titanium implants. They also retain less plaque, thus promoting healthier gums. So, what’s the solution? That’s the million dollar question. There really isn’t one perfect solution. There are a number of good options and we can direct you away from all the truly poor options, but even some of the good ones have their potential risks and drawbacks. There’s no ideal answer, if there were, we would only be promoting and performing that therapy. So, there are problems with root canals, and problems with extractions, how can dental professionals treat diseased teeth, while observing the issues presented by Dr. Price, Dr. Meinig and others and do so in the healthiest way possible? The real answer is to have a one-on-one consultation with us where we can walk you through your particular options, give you the best advice available for your particular situation, answer all of your questions and help you make the best decision for you.